Last week, I introduced Fall with a no bake pumpkin oatmeal cookie. But, I had a problem. What do I do with the rest of the pumpkin in the can? I HATE recipes that have you use ½ can of something and then you don’t know what to do with the leftovers. Yet I did this to myself and all of you. sheesh. In the post, I asked what to do with the rest of it and I got many great answers. Readers suggested adding pumpkin to pancakes, muffins, soup, oatmeal, chili, and feeding it to a dog. Who knew pumpkin was so versatile? All I could think of was a mini-pumpkin pie because I LOVE pumpkin pie. If you don’t know what goes into pumpkin pie, perhaps I shouldn’t tell you. You take perfectly healthy cooked pumpkin and add cream, sugar, and eggs. Then, you pour it into a crust with 8 tablespoons of butter (minimum). Back to the point! I decided to make a “Pumpkin Pie Smoothie” because I couldn’t get pumpkin pie out of my head. I used yogurt and banana to give the pumpkin a depth of flavor and I turned out a smoothie with 383% of your daily value of vitamin A, 12% of your daily value of iron, and 16% of your daily value of calcium in just one serving. This is no pumpkin pie, people, this is a SUPER drink. The sugar in the drink is from the pumpkin, yogurt, and banana. There might not be enough of it to get that “treat” kick you are looking for. I did add some maple syrup and still felt virtuous. I can’t wait to try all the other great pumpkin ideas. Maybe I should start “Pumpkin Mondays for when your head feels like a pumpkin”. Sound fun? 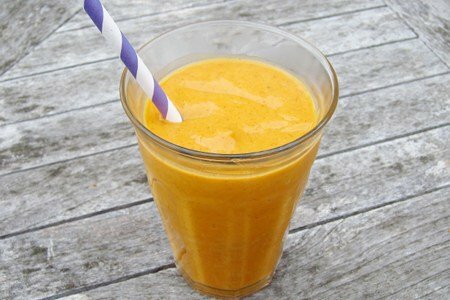 Have you tried to make a pumpkin smoothie? What did you use? Put all ingredients into a blender and blend until smooth. Serve and enjoy! Pour leftovers into drink container for later consumption. If you’re looking for a snack that tastes delicious AND is good for you, then you’re in for a treat! This sounds delicious! I love pumpkin! Thanks for the recipe! Ohhhh yummy!! One thing I always have in the fridge in the fall is pumpkin!! YUMMMMMMY! It is in the 50's this morning in Georgia and it feels like Fall! I can't wait to go for a run and a pumpkin smoothie will be great for an after run treat! I will probably add a scoop of protein powder! Bring on the pumpkin recipes! Thanks for this recepie, I just went and got the libby's can. Just one question - how is this 4 points? I thought pumpkin was 0 so all that counts here is the yogurt? Thanks! I might use the frozen pumpkin left over from last fall's crop. With frozen bananas and a little fat free milk to thin it out you can eliminate the ice! I hate smoothies that taste watered down because of all the ice. Pumpkin Mondays! I hope this idea comes to life!!! Don't forget microwave pumpkin custard! This recipe was a game changer for me. I got the recipe here and I keep canned pumpkin on hand so I can make it for ... snacks, breakfast, a tiny dinner if I know I must eat but aren't super hungry. It's fast, pretty healthy, with protein and fiber, I can make it sweeter for desserty-treaty needs, or less sweet if it's replacing dinner. <3 Love it! Last fall I made mini pumpkin pies using phyllo dough for the crust in mini muffin tins, then a "healthified" recipe for pumpkin pie in each one. Delish! I bet if you used vanilla yogurt you would get the slightly sweeter taste you are looking for (though I have not tried it - YET!). I love pumpkin too! And if you take the recipe from the Libby's can to make pumpkin pie, it's not nearly as fattening and still quite tasty. You can use fat-free evaporated milk. I think a little vanilla would be a great addition as well; can't wait to try it! Like someone else mentioned, I freeze bananas often for smoothies (no one in my house likes to eat them once they start getting brown spots). It's a great way to cut back on the ice if you prefer. For me personally, I buy my yogurt plain and sweeten/flavor to taste. Sometimes the sugar added to flavored yogurt is through the roof! I find I can sweeten with agave nectar or honey, and a little goes a long way in flavor! Sounds delicious... here's my favorite smoothie recipe. Blend into smoothie. If you haven't tried Shakeology, it is a must try. It has helped me lose and maintain 100 lb weight loss. Wow. This do sounds wonderful. definitely going to give it a try. I get the big tubs of plain Chobani and spoon it into ice cube trays then freeze and add to all my smoothies. The food salvage store always has over ripe bananas that I stock up on too. Just peel, break in half and freeze. I hate adding ice cubes to smoothies so the more frozen stuff I add the less ice I need. I've never been too big into smoothies, but the pumpkin really caught my eye. I added a tbsp of chia seeds and it was a delicious breakfast. I think it's going to have some lasting power to keep me full through the morning, too!! I love anything pumpkin. I can't wait to try this! This sounds delicious. For sweetness, you could always use honey. It is better for you than the sugar. You could add the same spices that you add to pumpkin pie. Then, it would give you the taste of pie. You have great ideas.